Platinum has a versatile and necessary function in one unique industrial application that makes it irreplaceable. It is used in catalytic converters, which reduce the amount of carbon monoxide and nitrogen based oxides that are emitted from automobiles. Despite its rare status, platinum will continue to be in demand for essential purposes, which confirms its worth as a bullion investment. Platinum is a dense, greyish-white metal that is malleable and can be used in a number of different forms. It is one of the most rare precious metals on Earth. Platinum is mainly used in emission control devices, multiple industrial uses such as petroleum refining, medicine, dentistry, jewelry and watchmaking. Platinum is fifteen times more rare than gold. Platinum is only mined in South Africa and Russia ensuring its rare status as a bullion investment. 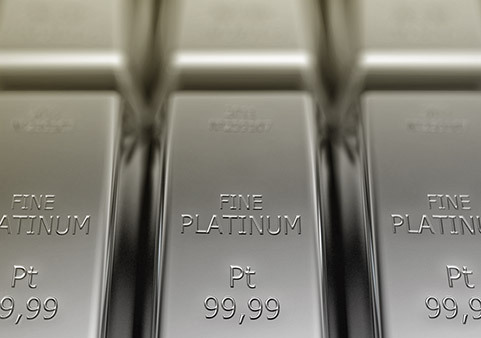 Current stocks of platinum are relatively restricted. There are different ways to hold your platinum investments. You can store in a fully insured secure facility and arrange personal delivery. If you would like to add platinum to your investment portfolio, get started here.